INFYMAX Solutions Pvt. Ltd. | Blog Archive >> » How to handle an ANGRY client? 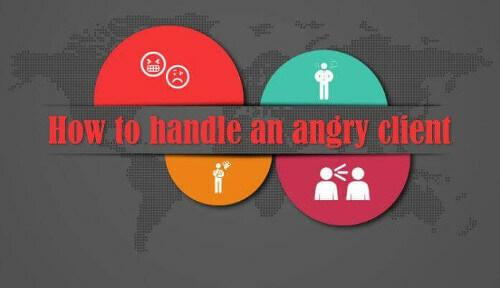 Home Blog How to handle an ANGRY client? How to handle an ANGRY client? The moment you realize that the client is angry, your first duty should be to apologize immediately. Now the second duty is even equally important as the first one, i.e. listen minutely to the client because proper listening solves half the problem. Let the client feel that you are taking the situation seriously and noting every details provided by him. Give importance to the client’s perspective. Now the next job is to figure out where the mistake is. Is it at your end or, at client’s end? Show the sportsmanship and apology to the client. Take the ownership of the mistake as well. Since you know that the mistake is at your end, so put in some effort and work a little on the issue. Decide a time frame required to resolve the issue. In all this, make sure that you are in touch with the client regularly and you keep him updated with the status of the solution in time to time. Clients will be very happy if the problem is resolved before the given time frame, hence fixing the problem before the time period should be your assured target. Never let the client feel that it’s his mistake. Don’t accuse the client indeed derive a situation. Instead of hurting client’s ego you should work together and come up with some solution. Remember one thing, clients are much more happy with the solution rather than knowing whose mistake it was. Client satisfaction is the major goal of every company. Hence become a good listener, invite client’s perspective, do vigorous research and become solution centric.